On 17th August I had the pleasure of facilitating a beautiful, hand-painted Chartres-style labyrinth as part of this year’s Saffron Walden Maze Festival. 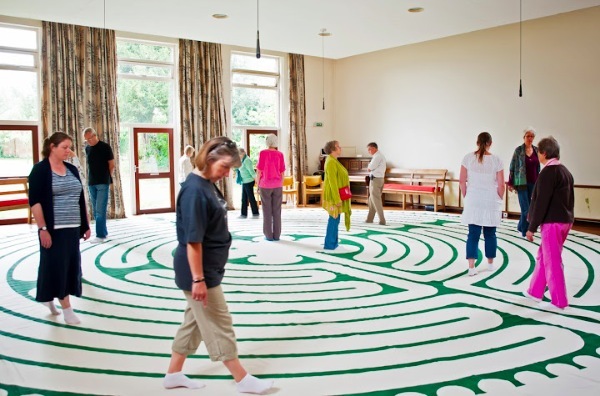 At 36 feet across, the labyrinth is almost full sized, and was kindly loaned by the University of Kent. 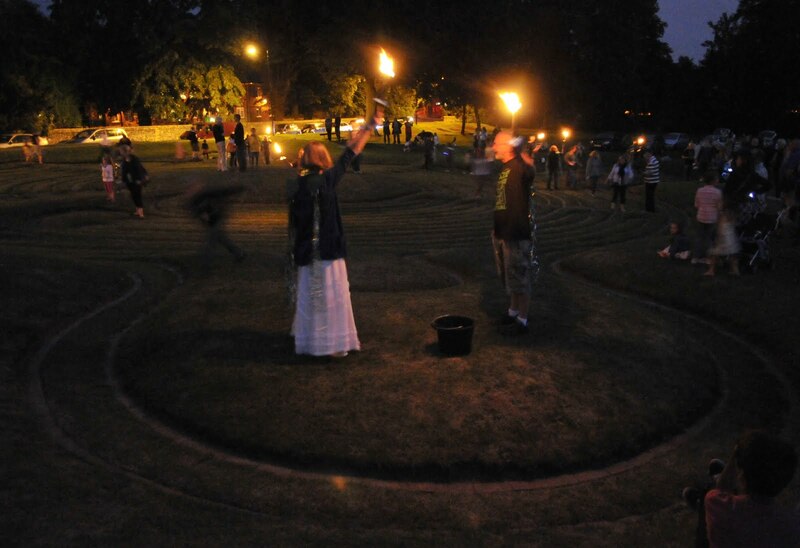 The opportunity to facilitate came to me via Jan Sellers, who is well known for her labyrinth work in Canterbury and beyond. Barbara Wilcox of the Maze Festival team helped with transporting and storing the labyrinth, and Judy Fox and Veriditas facilitator Felicity Collins also gave invaluable support on the day. Our venue was the historic Saffron Walden Friends’ Meeting House. We were lucky to have a bright, warm day. 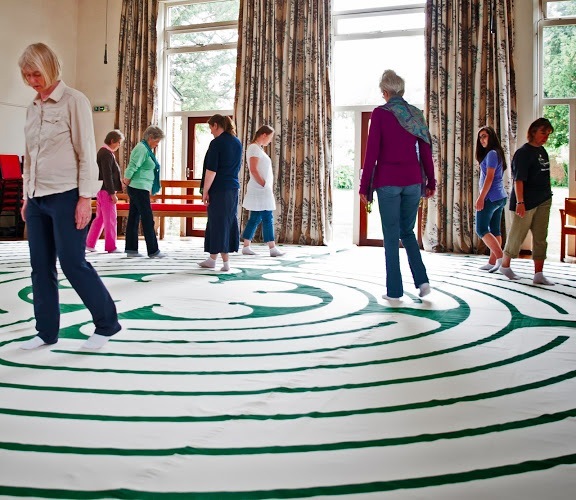 The hall made the perfect space for the labyrinth walk, with its aura of peace and tranquillity. We especially enjoyed the large picture windows which opened on to the garden and gave a feeling of spaciousness and connection with the natural world. 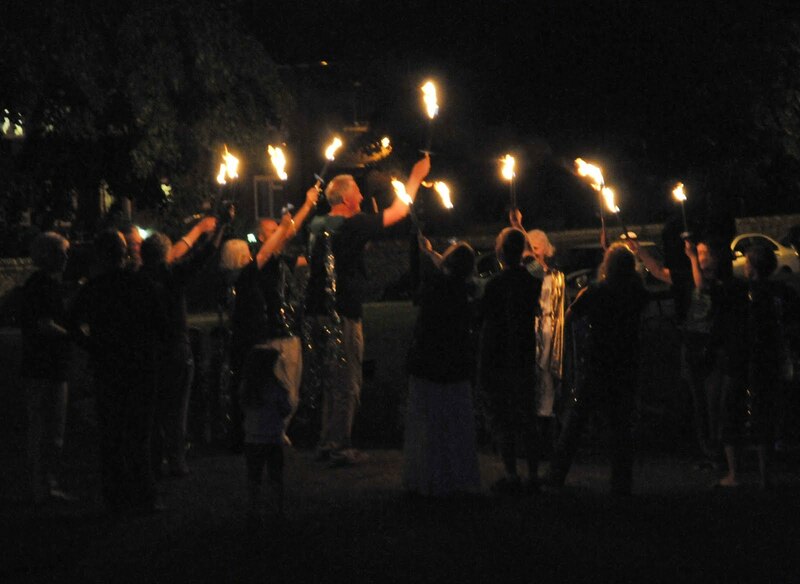 The music of 13th Century mystic Hildegard of Bingen made a perfect backdrop to our experience. 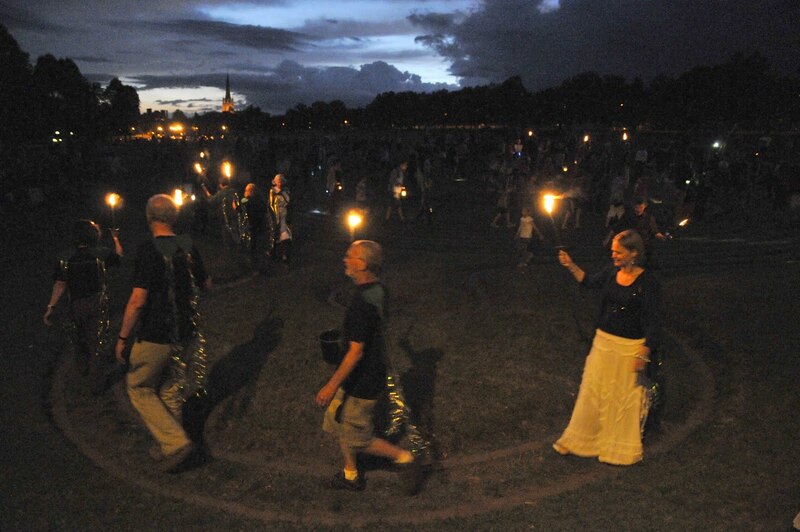 The walking of the Chartres labyrinth became an oasis of calm for many of the visitors and volunteers taking part in the Maze Festival. Elsewhere there were a multitude of creative, fun, energetic and inspirational activities taking place over the entire weekend, including story telling, exhibitions, guided maze walks, timed races in the turf maze on the Common, and the unveiling of a brand new octagonal labyrinth, set in paviors in the floor of the band stand in Jubilee Gardens. Artist-in-Residence Bryony Pritchard led maze making workshops, and many local groups made their own mazes and labyrinths on the Common. Local school children wrote some brilliant poems and contributed excellent art work and a display of photos of school maze events. 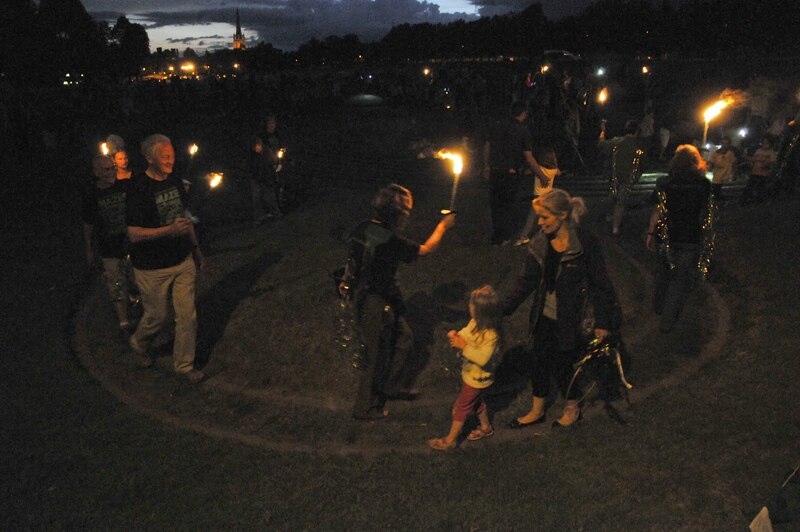 After experiencing a wonderful infusion of peace from the Chartres Labyrinth on Saturday, I made my way back again on Sunday 18th to sample some of the goings-on on the Common and then take my place as one of twelve torch bearers leading the ‘Procession of Light’ around the ancient turf maze at nightfall. It was a truly magical experience! Thanks to the wonderful Saffron Walden Maze Festival team, to the Saffron Walden Camera Club for the wonderful photos, and especially to Barbara Wilcox and Emma Horton who worked so hard and looked after me so well.